Hanoi’s Catholics continue their sit-in in the gardens of the ex-nunciature, despite the government ultimatum to free the area by 5pm Sunday last. State newspapers launch a new wave of insults directed at the bishop and faithful. Some Catholics believe this slander campaign is preparing the ground for a show of force. Since December 23 the former residence of the Vatican nunciature in the capital has been the focus of gatherings for thousands of Catholics who demand the building sequestered by the government in 1959 and set to become a restraint and night club be returned. The local government has already threatened “extreme action” if the group of faithful persists in holding prayer vigils in front of the building and in the garden and if they do not desist in “undermining public order”. Fr. Joseph Nguyen tells AsiaNews: “At the moment there are hundreds of religious together with many lay faithful gathered in the garden of the ex nunciature in prayer. But there are also a great many police in uniform and in plain clothes. These mix among the people taking photos and making films with video cameras. I fear an attack at any moment. The Archbishop, Msgr. 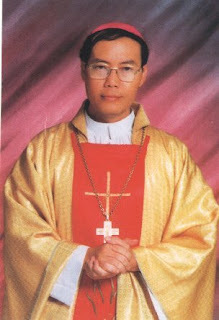 Joseph Ngô Quang Kiệt, has told us that praying is a basic human right protected by the law and that he is ready to even go to jail for his flock, if the government makes a show of force”. Meanwhile a fresh press campaign accuses the Catholic faithful of “naivety” and in trusting too much in their leader. Papers also accuse them of aiming to “illegally take possession of the building”. Even the police newspaper Capital security, accuses the Hanoi clergy of “lying to their people” and of “forcing them to demonstrate against the government”. Joseph Vu Van Khoat, who has been taking part in the sit-in in the residence garden since last Friday has described the paper’s claims as “nonsense”. He told AsiaNews: “I don’t care what they say. You go out and ask anyone on the streets. No one believes them. In fact, those who have written such articles know well that we have gathered here voluntarily to pray peacefully for justice. But it’s their job to spread lies”. “Why don’t they publish the Archbishops statement in the papers?” wonders Maria Doan Thi Tuyet. In fact on January 28th, he issued a statement explaining that the nuciature residence was never “donated” (as the local government claims). The communiqué also affirms that the gathering of the Catholics is perfectly legal. Elsewhere in Asia, Pope Benedict this morning named Auxiliary Bishop John Tong of Hong Kong as coadjutor to the city's bishop, Cardinal Joseph Zen SDB. Zen, 76, and Tong, 68, were ordained bishops together by the protectorate's first cardinal, the late John-Baptist Wu, in the months before its 1997 handover from British to Chinese oversight. The cardinal has been a key go-between in the Holy See's sensitive path toward rapprochement with the Communist authorities on the Chinese mainland, a role he'll likely step up in his eventual retirement.